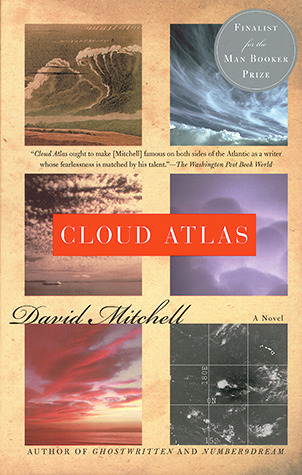 David Mitchell's craftsmanship in Cloud Atlas is exquisite. The book is comprised of six separate stories, each set in a completely different time and place, that are inextricably interwoven. And not only are they all connected, they are actually nested together in such a way that each story is read or told or experienced by someone in the next until the sixth story. This sixth tale is told in full, and then the novel moves backwards in time to complete the previous stories, all of which were left unfinished, until we end up back where we started, on a sailing ship in the middle of the Pacific Ocean in 1850. I'm still, days later, trying to trace all the points of connection and similarities and overlapping themes. It's mind-boggling. Truly, each of these stories could have been a novel, or at least a novella, in its own right. The inter-connectedness serves to enhance rather than distract from each story (though I did have to flip back and review the last few pages of each story's "part one" when I got to the continuation later in the book) and underscores the inter-connectedness of all human life, one of the overarching themes of the book. While there were definitely some of the stories I was drawn to more than others, the whole really is greater than the sum of its parts. 6) about two hundred years later is seen by natives on the island of Hawaii. In a post-apocalyptic world, the people live much as the island natives in "The Pacific Journal of Adam Ewing" did. Each story is left somewhat in the lurch, except for the sixth and central one that is told in its entirety. This technique gave a sense of urgency to the whole book, as all these cliffhangers piled on, one after the other. Then in the last half of the book, with each resolution I could feel the tension ratcheting down, as the characters came to a point of understanding or acceptance or new resolve. The genius of this novel is that it is a pleasure to read straight-through, but also provides enough food for thought for several re-readings and angles of analysis. This is definitely a book to read more than once in order to trace the myriad threads that link the stories together and to mine the rich characterizations and web of human interactions across time and space.